Anzac Day as we know it was first observed on 25 April 1916, as people came together to honour those lost at Gallipoli. In Australia, some state governments organised events to commemorate the occasion—but the Commonwealth, other than naming the day as Anzac Day, did not. The resurgence started in the 1980s and 1990s. The RSL had been slow to welcome ‘others’—notably those who did not serve overseas, including most ex-servicewomen, and veterans of the ‘small’ wars. With a younger leadership, it has relaxed the rules to be more inclusive. Governments have reinforced the day’s significance with commemorative programs that reach out to the community. After leaving Mount Surprise we took a long, very adventurous and memorable drive to Karumba which sits on the Gulf of Carpentaria. Did I mention it was a adventurous drive with extreme breath taking sunsets, wildlife alongwith change in the landscape? All this make my journey most impressive and lifetime family trip to Karumba, Queensland. 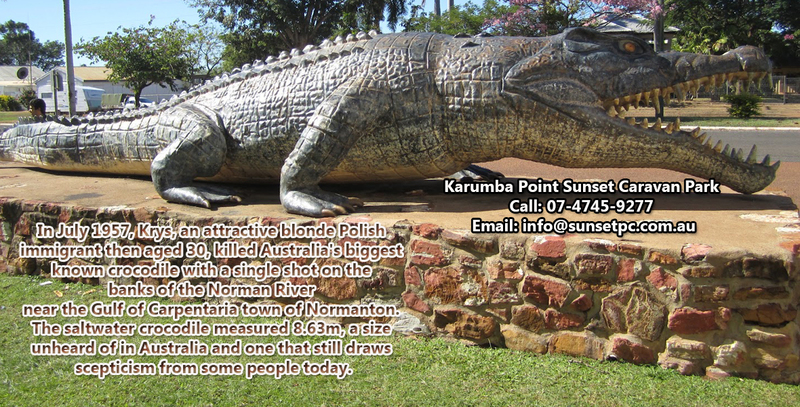 Before we reached Karumba we passed through Normanton with observed all my attention where there is a replica of the largest crocodile ever caught. Here is ol’ Krys. Krystina Pawlowski (a chick!) shot the croc, although all photos were lost in the ’74 floods. This replica is an artists’ impression and built to the dimensions listed in the Guinness Book of Records. From Normanton we carried on to Karumba but I will leave that until the next post. Cheers Helen and Dave. There’s just something that doesn’t seem quite believable about this statue…like the size? Though I don’t want to proven wrong on this account. After setting up, we headed straight for the tavern for a beer and to watch the spectacular sunset. Here’s a few photos. Now we reached to Karumba usually people called this place Anglers Paradise. I call this place dreams come true land as i had heard many stories about wildlife, millions of stars gazing in sky, dramatic sunsets valley and last but not least endless fishing catch spots. 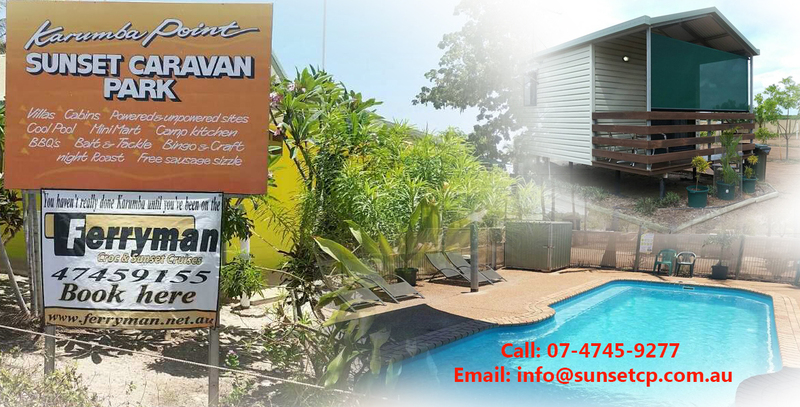 We stayed at Karumba Point Sunset Caravan Park where we found very friendly staff, clean amenities, cement slabs with shaded trees, Swimming Pool, Fish Cleaning Area, BBQ Area, clean Camp Kitchen, and good pizza service. The following day we went to the Barramundi Discovery Centre. It was pretty good. We learned that all Barramundi start life as males. When the wet season comes it flushes them out of the river into the ocean where they start to grow and change to the female gender. Right on! There’s are so many thing to do in Karumba such as playing Golf to Exotic scenic flights. We took our children to water Park to enjoy some quality with children. Next, we come back Karumba Point Sunset Caravan Park and enjoy BBQ at Park with other Park visitors. We enjoyed friendly atmosphere at Park. We couldn’t forget brilliant experience of gazing millions of stars outside our Ensuited Cabin after viewing world most beautiful sunsets. From that initial bite to the tug-of-war battle, there’s no greater feeling than knowing you’ve got a big fish at the end of your line. As the rod bends and your mates cheer, the sudden kick of adrenaline forces you to level up and reel that fish in. When colour hits the water’s surface and the fish species is identified, your final task is to get it into the net and in the boat. But once that fish is slapping around on the floorboards, you can finally celebrate that the suspense is over and you’ve bagged yourself a nice one. Yee ha! If it’s time you headed out for another fishing adventure, Queensland has you covered with some of the best fishing destinations and local hot spots where you can bag your next big fish. And, if you’re up for some friendly competition, show us what ya’ got at a local fishing competition. Tropical North Queensland and off the coastline of Karumba are some incredible fishing spots (in the Gulf of Carpentaria) where you can reel in prize-worthy fish including Jew fish, barramundi and king salmon. No boat = no problem. Fishing charters are available, but shore-based fishing is also great in Karumba with local spots along the Norman River Bank or at Karumba Point. With a variety of ‘catch and release’ fishing categories for seniors and juniors, the Karumba Community Anglers Classic is an epic long weekend of non-stop, rod-bending action. This volunteer-managed event raises funds to support the ongoing efforts for barramundi restocking in the Gulf rivers. With entertainment and novelty land-based activities to complement the fishing, it’s an event for the whole family (with cash prizes up for grabs).